For about two weeks, I have been using the St. Ives Collagen Elastin Facial Moisturizer. I started using the moisturizer after I ran out of my normal night cream. Although, I have had this product for several months stashed away midst the sea of products. I only used it a few times and then stopped for whatever reason, honestly I just forgot about the product. However, since I ran out of my favorite night cream (Meaningful Beauty Night Cream). I started using the moisturizer again. I have got to say the moisturizer is a pleasant surprise. My skin does feel tighter and smoother. Now as a far as shrinking my pores, I cannot really attest to that since I did not have a problem with large pores to begin with. 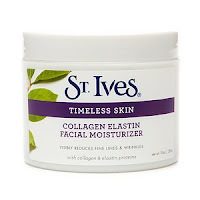 However, the moisturizer is light, smooth and non-greasy, and as with all St. Ives products the price is affordable. I have been applying the moisturizer in the evening as a night cream. When I wake up the next morning, my skin feels hydrated, feels smooth, and it looks pretty good. I also have been using the moisturizer after I use the Queen Helene Mint Julep or Clay Mask every few days and it is a perfect moisturizer to re-hydrate your skin after using the face masks. Now, anything that can make my skin feel hydrated after the Mint Julep Mask is worth a thumbs up. I am sure if you have ever used the Mint Julep Mask you understand. In addition, I rub the moisturizer onto my hands and lips which has been a good hand cream and lip moisturizer. I can’t believe I was sleeping on this moisturizer. I would definitely recommend you give it a try.